It looks like Anthony Weiner is behind another bulging scandal. After a week of facing questions about lewd Twitter photos, Rep. Anthony Weiner Saturday had more explaining to do: why his Nissan Pathfinder has New York license plates but a 2007 registration sticker. 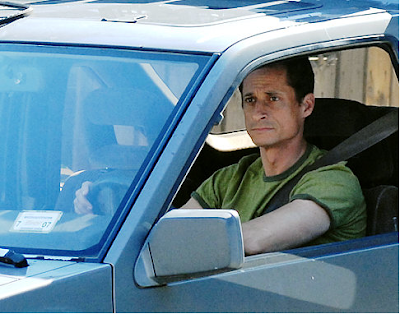 A photo of Weiner behind the wheel of his more than 20-year-old SUV appeared in Saturday's Daily News as he left his Washington home Friday night. It had a New York license plate - US Congress 9 - but no sign of an inspection sticker in the windshield and what appeared to be an expired July 2007 registration sticker. Jammed on the dashboard was a sign that read "Congress." Not owning up to vehicle laws is sort of Weiner's stock and trade. Earlier in the year Weiner won the prize as the congressman with the most outstanding parking tickets.